The ‘Deeside’ training camp was based at Templars’ Park, Maryculter on the banks of the River Dee near Aberdeen. The camp was for M/W16’s born in 2000 and M/W15’s born in 2001. The camp is usually no more than 20 athletes, the final number being determined by the Selectors and the Team Manager. Two of the athletes were on last year’s Deeside tour – this did not seem to be a problem (note all exercises were planned new). 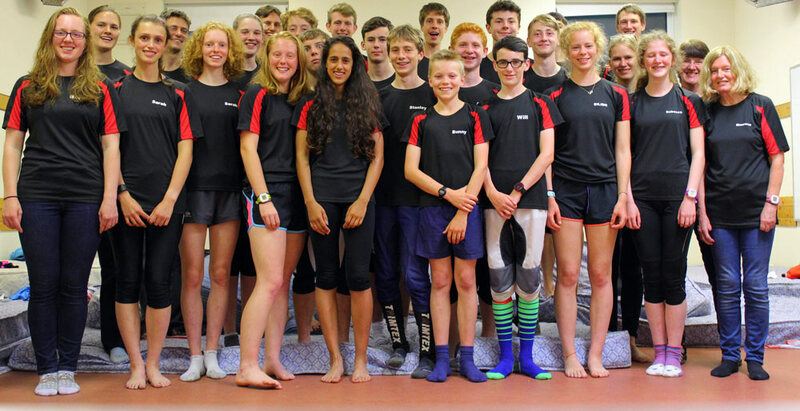 The TM and LC believe that we would have been fine with 20 athletes at the current staffing levels, particularly since the showering and clothes washing facilities were much improved. The majority of the tour was injury free, although there was some minor ankle damage by Stan and Anika – the former being much improved by the end of the week and the latter sitting out the final day. 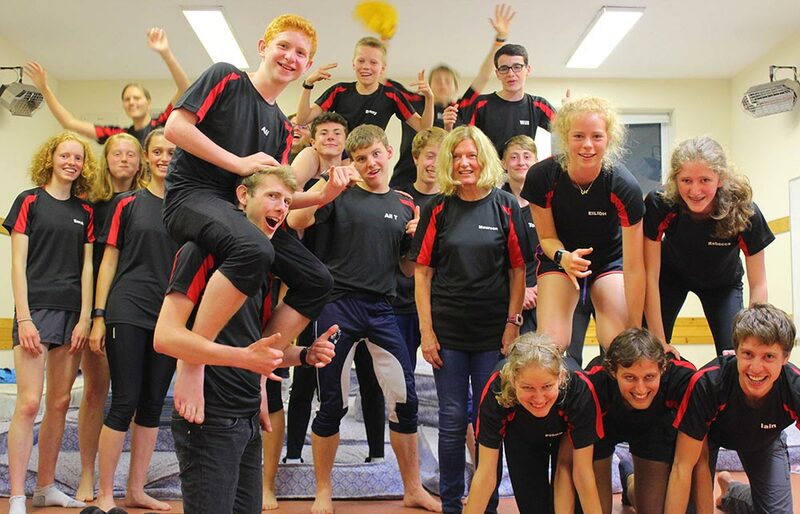 The coaching team were relatively inexperienced, but their youthful joyfulness lead to a most enjoyable tour for the athletes. We used a coaching group structure with pairs of coaches taking primary responsibility for 4 athletes between them. 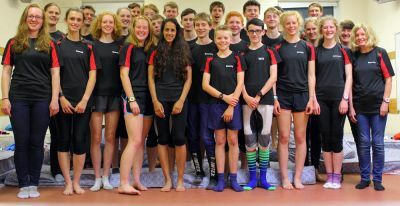 The coaching groups were designed specifically to mix genders and regions, and with a mind to avoiding athletes having the same primary coach as during a previous tour. The coaches in charge of each team were also primarily responsible for compiling their athletes’ tour reports. These groups were also then used as the basis for duty teams for the week. The duties generally worked very well, although periodic cleaning of the showers and dining area would have been useful. It was difficult to orchestrate sufficient cleaning of the busses, buildings, etc with a 09:52 train for the athletes – consequently 4 of us spent a few extra hours doing this. 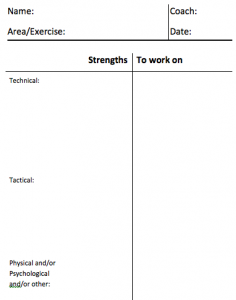 Towards the end of the week the athletes reflected and then filled in a coaching comments sheet (see last page) for themselves – this was very effective but would have been more so if they had done so more independently before discussing with a coach. It would have been good for each athlete to leave with a sketch training plan for a typical week in the autumn, and some notes on how to adapt this through the year. A short reflective debrief at the end of the week allowed the athletes to decide upon (and share with us) particular points to take away and work on, future goals, and some feedback on the week. These were then recorded on postcards which Matthew will send out in December and incorporated into tour reports. We arrived on Monday 1st and departed Monday 8th. Tour tops: “contrast tech tee” were sourced from frontrunner.org.uk. Service was generally excellent and speedy. Quite wearable customised named tops came to about £9, and I also purchased a number of rather nice medals with GBR coloured lanyards and the engraving “JROS tour champion” for 85p each. Both were well received by athletes. The areas used were mixed: Glen Dye was fabulous except for the orange areas which had impassibly heavy bracken – perhaps there are two good days of training here (bilberrys also excellent). Scotly was excellent in all areas used by the exercises. Balmedie was excellent and a good source of variety. Coull was pretty decent around the top of the hill and apparently in the northern section too, however Sluie was mediocre, Newmillhill was pretty poor and Tyrebagger is a place to avoid in future years. SI equipment was borrowed from WCOC as were stakes and kites; GRAMP and MAROC were most kind in arranging OCAD files and access for us with a small charge. My training kites were supplemented by a set of CUOC reflectors which were used at night. Having my printer available during the tour was extremely useful, Matthew also brought a printer with a scanner. 4 more JROS radios were purchased – 8 was a good number since most forest coaches had one. All 8 were The tlkr T80 extreme model which continued to perform very well. Tour accounts are below. The same system as last year was used to minimise athlete expense - £230 initial cost plus top up if needed. This year due to having 4 fewer athletes and greater travel expenses (not a S6D year) a top up of £18 per person was needed. Feedback from the parents on this method was positive. BML printers were duly credited on our tour tops for their continued excellent and valued support, and Turner hiredrive once again supplied vehicles in a cost effective manner. Notes were made throughout the week by coaches using this A5 pro-forma, as per previous years. The camp will run from Monday 1st August – Monday 8th August 2016. The camp will be for no more than 20 athletes, the final number being determined by the Selectors and the Team Manager. Athletes will be selected in increasing percentage of time behind the winner in each of the above races as averaged over their best three results in the above races.